The first message in a series and all replies to it are grouped into a message thread (for details on how to work with message threads, see Group and sort emails). To view any email in a thread, click on the line containing that email. Restriction. Emails will not be grouped into threads if the group by subject option is disabled. You can manage all emails in a thread together (for example, mark all as read, delete or forward them all). Just click in the subject line. 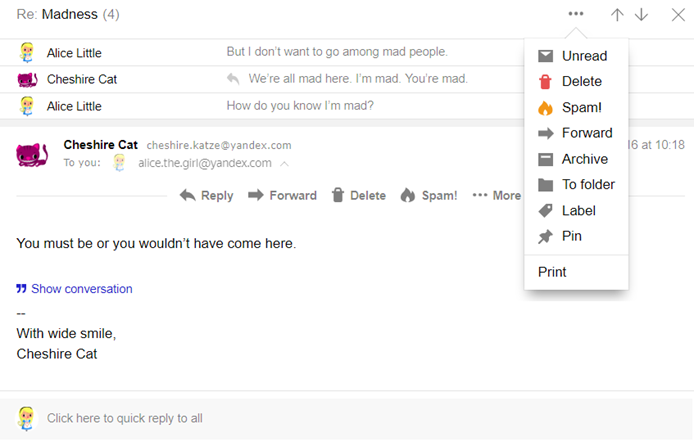 Use the button to move to a different email thread. Restriction. Messages can be managed within a thread if you enable the open message in list of messages option.